Do you like your granola or cereal for breakfast? Is your idea of a balanced breakfast Kelloggs Corn Flakes or Rice Krispies with a glass of milk and tropicana orange juice? That used to be me…. until I realized I was basically eating a bowl of sugar. And I know many people are still eating this type of thing for breakfast today, especially kids. Did you know most cereals in the grocery store that are marketed towards children contain 10-20 grams of sugar per serving? Not to mention the artificial ingredients, chemicals, additives, and toxins like glyphosate (the active ingredient in Round Up that has been linked to fatty liver disease and cancer) that are lurking in packaged and processed foods such as cereal, and that are affecting human health more than we even know. Avoid processed and packaged foods. Buy organic. And make your own! 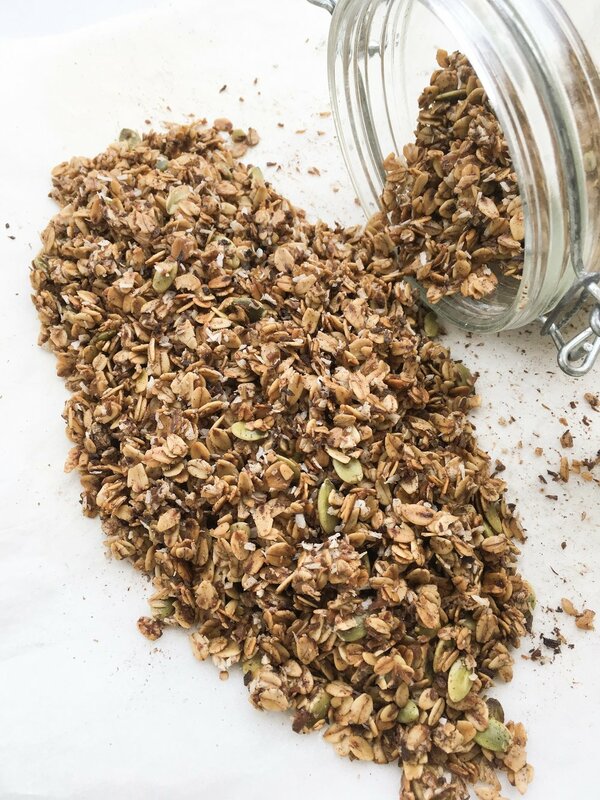 The best part about this granola, after the fact that it is deeeeliocious, is how simple it is and quick to make. You can make yourself a big batch and store it for the whole week so that you have a healthy breakfast ready in the morning! And you can customize it any way you like according to your taste. Preheat the oven to 250F. Set a tray with a baking sheet and a tbsp of coconut oil in the oven. When melted add 1 cup of granola and spices.Bake for about 30 minutes or until golden brown. Set in a bowl and let the granola cool. Then add in the seeds, almond butter, and sweetener of choice, and mix well together. Serve as you wish. I love adding this to unsweetened coconut yogurt with blueberries as a healthy breakfast or snack!